Whenever Therese Borchard was weathering a personal storm, and help was nowhere to be found, her one guiding light was the question, “What would a therapist say?” The result was a sort of therapy scrapbook for rough days–a quick reference for anyone who needs a dose of encouragement, support and tried and true ways to cope. THE POCKET THERAPIST is a compact and accessible guide filled with techniques and advice to help combat everything from addictive behavior to negative thinking. As someone who has been on both sides of the couch, so to speak, I have often wished I had a therapist, my grad school pals, or a friend at the ready to give me little tidbits, reminders, and positive affirmations every now and then. The Pocket Therapist could be just the book for you if you’ve ever felt that way, too. The Pocket Therapist is a little book (not quite small enough for your pocket, but it will definitely fit in a purse), that advertises itself as an emotional survival kit. Author Therese J. Borchard is not a therapist, but she has been a patient. She compiled years of therapy homework and notes for her own benefit and asked friends and sometimes strangers to add their best pieces of advice. She realized that she had a helpful tool, and produced this book. 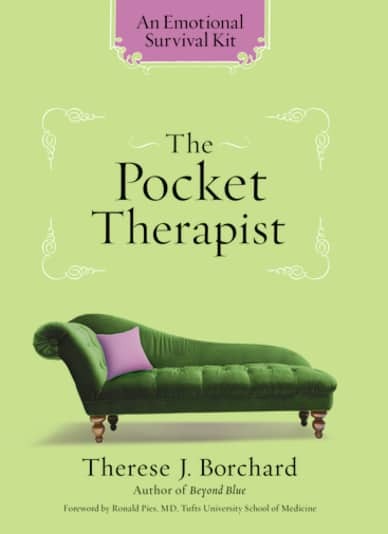 The Pocket Therapist has 144 little bits of advice that Borchard has picked up over the years, supplemented with little anecdotes about her life and adventures. She touches on depression, hope, and everyday stressors. I read the whole book at once, smiling, nodding, and book-marking pages along the way, but it would be also nice to read one story per day. The vignettes would make great journaling prompts, too! I recommend this to anyone who thinks they can use a little pick me up and inspiration! Build A Beautiful Blog Week- Sneak Peek! I like Simply Stacie on Facebook. My name: Sarah U.
I’d love to read this, sound helpful! This sounds like a nifty book!